How to cook the perfect baked oven fries – syn free, golden, crispy and delicious! 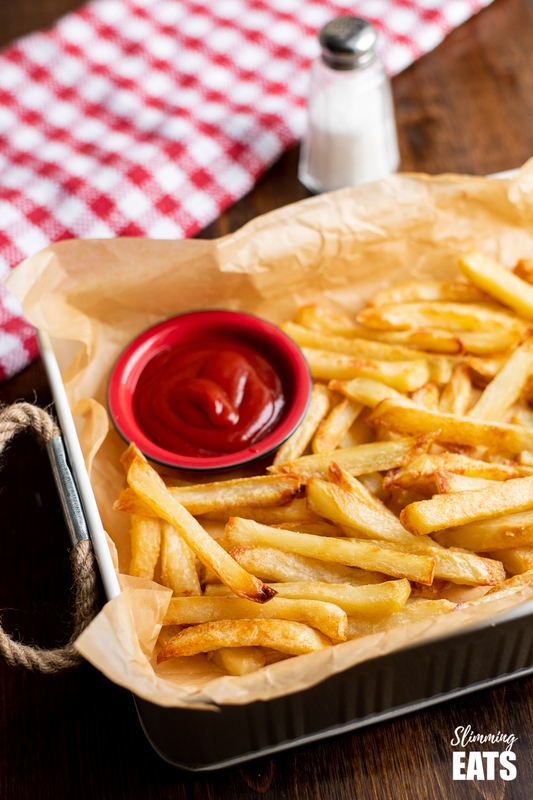 I can pretty much guess that before any of us embarked on this healthy eating regime, we would occasionally (or even more than occasionally) dig into a greasy filled bag of fries (chips), right? I will definitely raise my hand here. I am guilty of doing so. But my question is, why? and to be honest I really can not answer, why? because it is so easy to make healthier perfect baked oven fries at home and I actually prefer them to the grease-laden kind now. Hate chopping potatoes to make fries or chips? You seriously need one of these KitchenCraft Potato Chippers in your life. 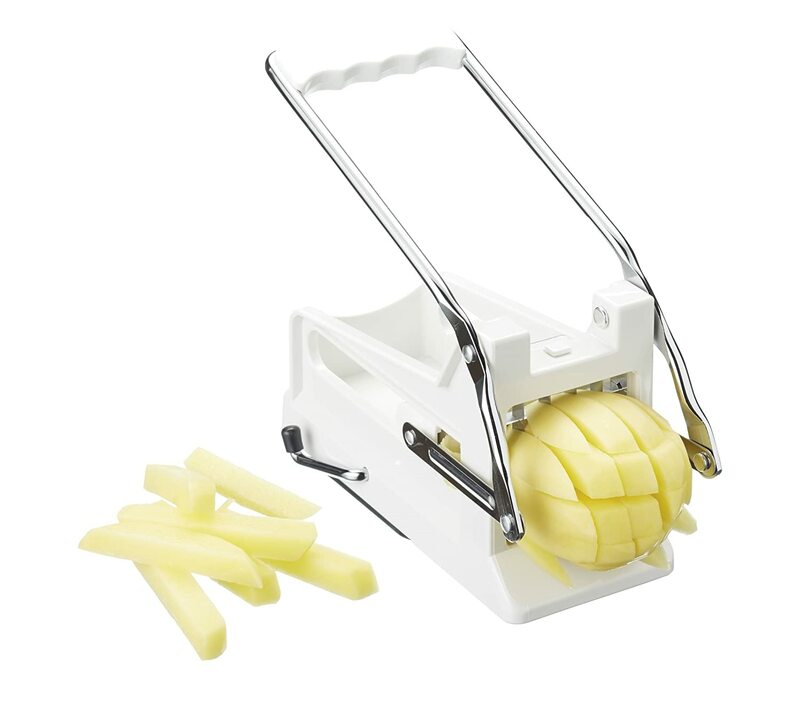 Before I became the proud owner of one of these, I would slice my potatoes by hand and now I really wish I had bought one of these sooner, because oh my goodness, it is so quick and makes perfectly shaped fries and comes with two different size blades. Okay, some may say that is lazy, but so be it. Lazy I am!! I love mine. You basically put a whole potato into it, press down the handle and voila!! you have chips. If you don’t even want to peel your potatoes, you can even leave the skin on, I mean skin on chips or fries are equally delicious and think of the fibre. Allow about 250g/9oz of potato per person. 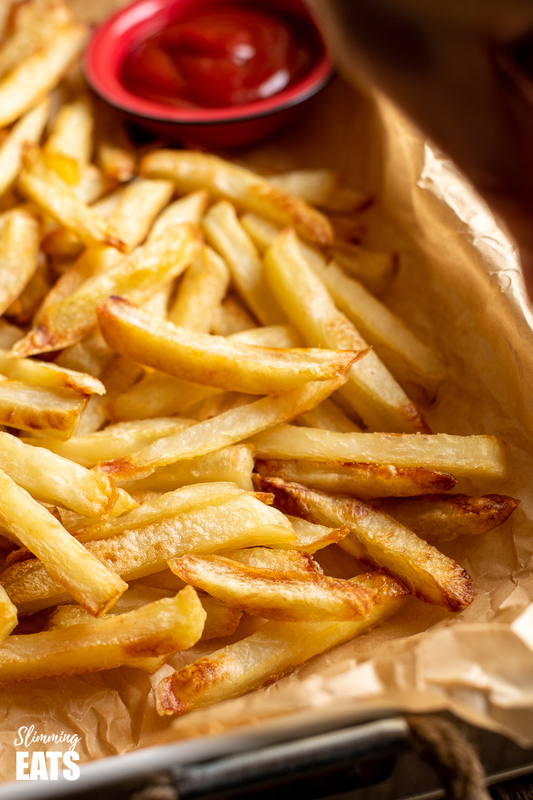 Make sure it is the floury type of potato if you truly want crispy golden chips. Here in the US/Canada Russet Potatoes tend to be the most popular variety, but in the UK it would be King Edward’s or Maris Pipers. You will also want a super large baking sheet and some parchment paper. 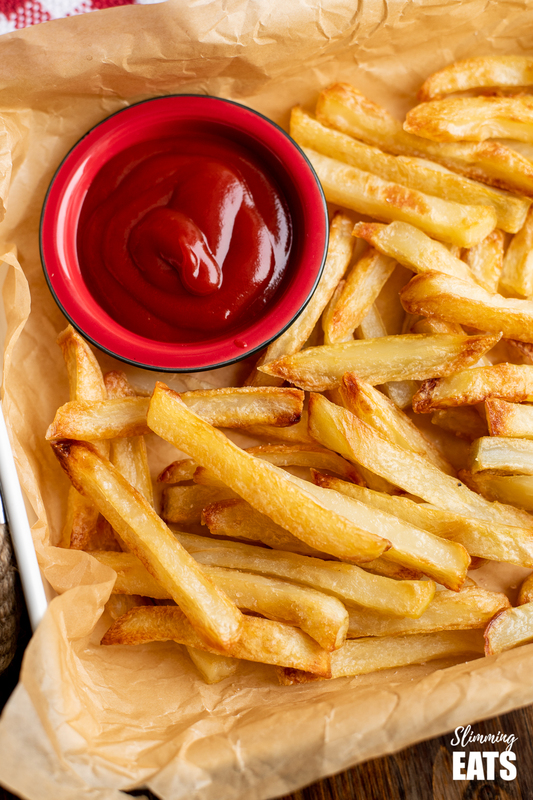 Because the key to making the perfect oven baked fries is not cramming them too close together on a tray. Know what happens when you do? 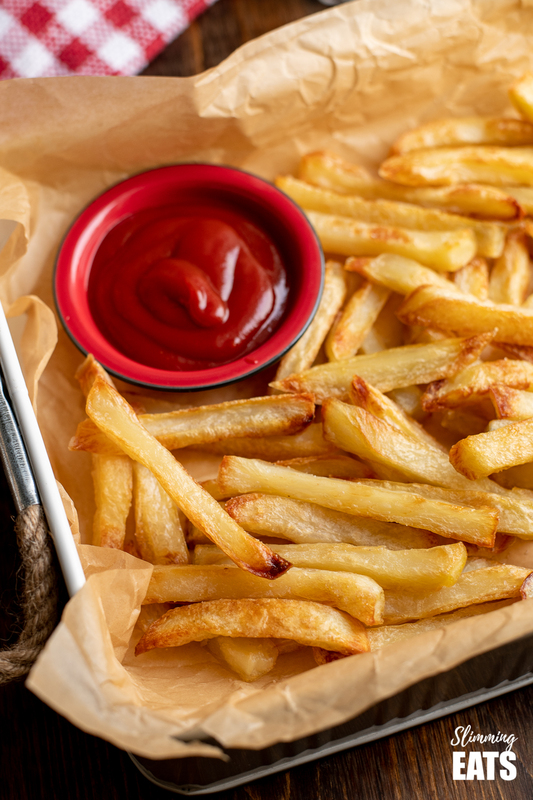 The heat doesn’t circulate around the chips or fries meaning they tend to steam instead and results in soggy and not very appetizing chips. Trust me!! 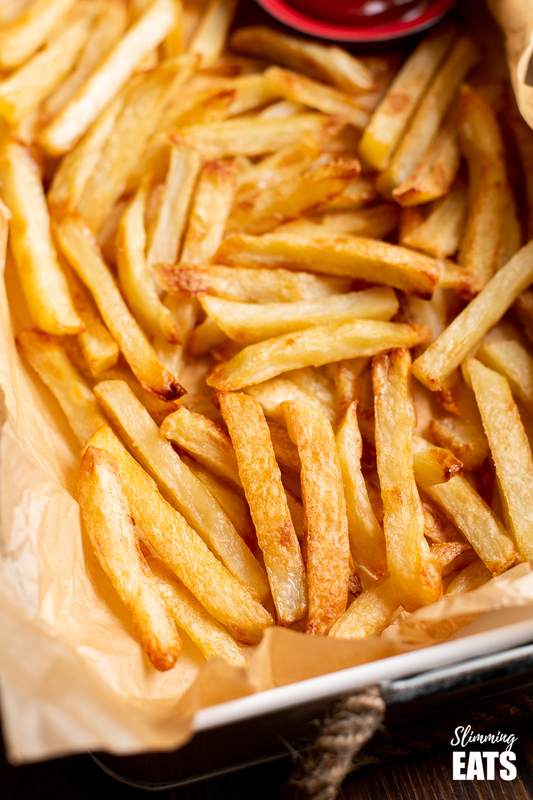 So once you have the desired chip shape, just add the chips to a large saucepan water, bring to a bubbling boil, then turn off the heat and leave them in the water for 3 mins, drain, rinse under cold running water and pat dry between a clean tea towel or some kitchen paper. Tempted to skip that part because you can’t wait? 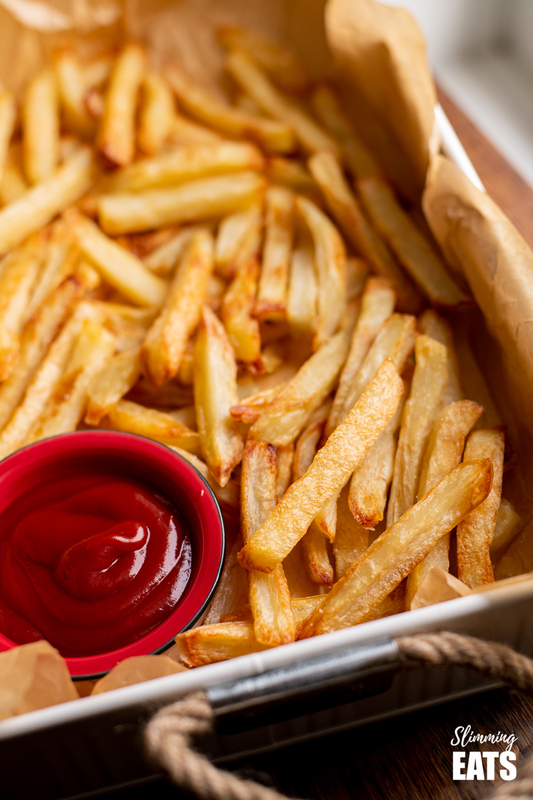 I personally wouldn’t even if you are cooking these perfect baked oven fries in an Actifry. The reason being is they will burn on the edges and be raw in the centre. Parboiling them like this really helps to make them golden and super crispy. You will love them!!! Then all that is needed is to add them to the large baking sheet, spray with cooking oil spray and bake in a hot oven until super golden and crispy, turning over halfway through for even crispness. If you are lucky enough to own an Actifry or airfryer, you can place them in there instead. I usually find they take slightly less time in the actifry compared to the oven. But maximum cooking time once added to the oven is about 45 mins. 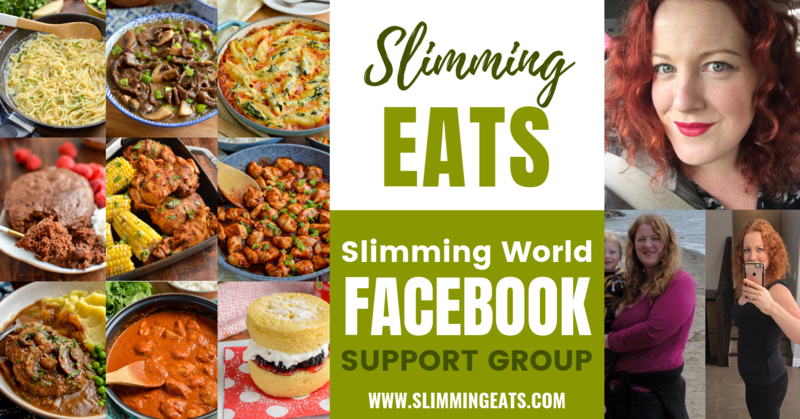 Serve sprinkled with plenty of sea salt and some ketchup is a bonus, even syn the bottled kind or make some of this amazing Syn Free Ketchup or Barbecue Sauce. Hey, you could even go down the garlic mayo route, by using mixing some low syn mayo, with crushed garlic cloves, parsley and salt. Heavenly!! How can I add a 1/3 speed foods to these Perfect Baked Oven Fries? 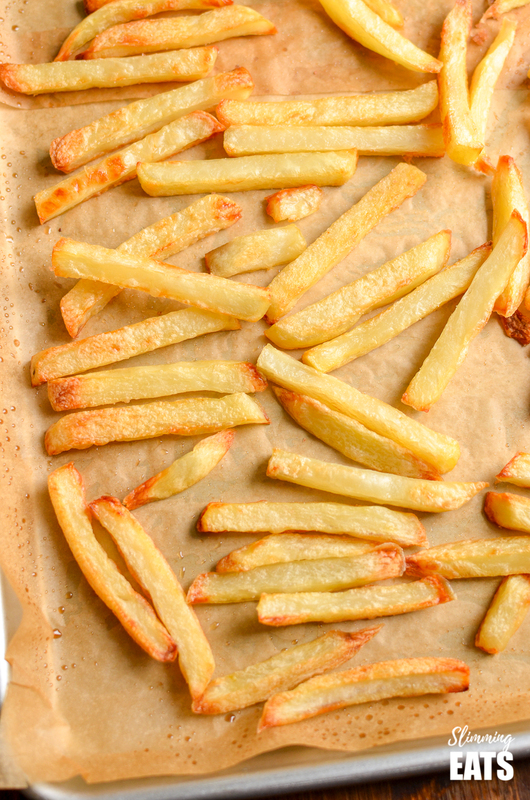 Need some seasoning ideas to vary these perfect baked oven fries? Try some of the below seasonings. Can I freeze some of these in advance? Yes, you sure can and it is something I do often. 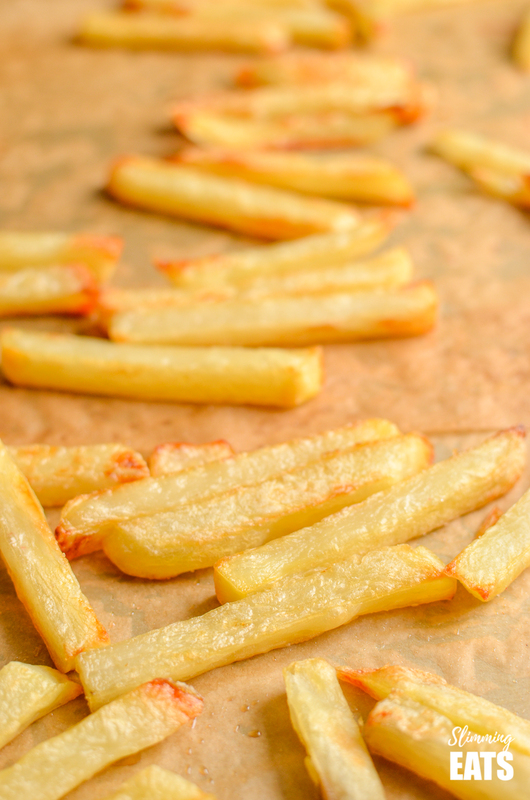 Once you have parboiled your fries (never freeze raw or they turn black) just allow them to cool, spread them out on a piece of parchment paper, place on a tray and carefully place in the freezer. Then once they are frozen you can transfer them to freezer ziplock bags. This will stop them from sticking together. You can also freeze these already prepared with the spice mixes above. How to cook the perfect baked oven fries - syn free, golden, crispy and delicious! 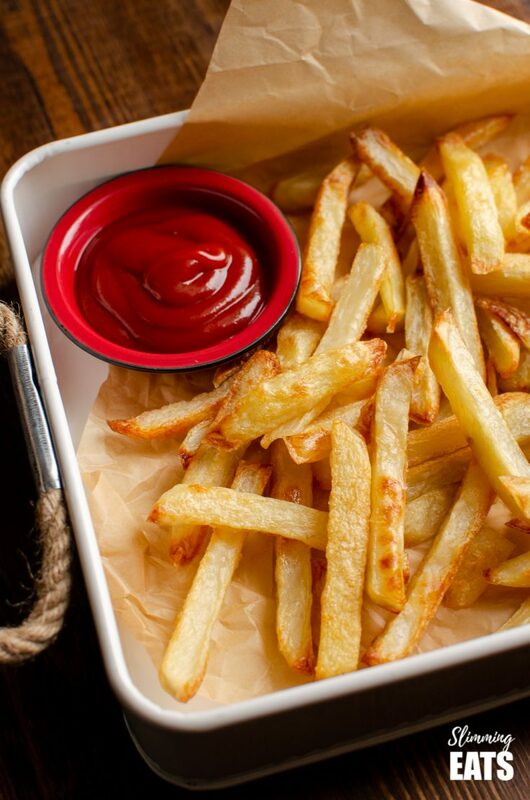 Slice potatoes to desired chip/fry shape, can peel or leave skin on. Add to a saucepan of water. Bring to a boil, once it starts to bubble, turn off heat and leave in water for 3 minutes. Drain, rinse under cold water, then pat dry between a clean towel or kitchen paper. Line a large baking sheet with parchment paper and spray with cooking oil spray. Place in the oven and bake for about 40-45 mins until golden and crispy, turning over around the 25 minutes mark. Season with more sea salt as needed and enjoy!!! Mmmmm egg chips & beans, food of the gods! I have been using this nifty gadget for 2 years now, and I love it.. like you say… why would we even want greasy chips/fries? I dont even like the taste of them anymore! Hi Carol, yes you sure can, just follow all the parboiling steps up to placing in the oven, but instead add to your air fryer. Perfect chips every time.